It is week 6 in the review of the CRM Field Guide Chapters from the book – The CRM Field Guide – How to CRM Like an MVP with Microsoft Dynamics CRM. This week it is the 26 page chapter 6 – Security. During the sales process Security is often brought up, but for most organizations it is only a brief conversation until later on during the implementation process. Generally, in the absence of specific direction by the client, the partner takes some basic steps to do some pre-configuration of the built-in security roles. In a January 2012 TechNet Wiki article I wrote on How to Avoid Human Induced Catastrophe in CRM I cover many of those basic steps. 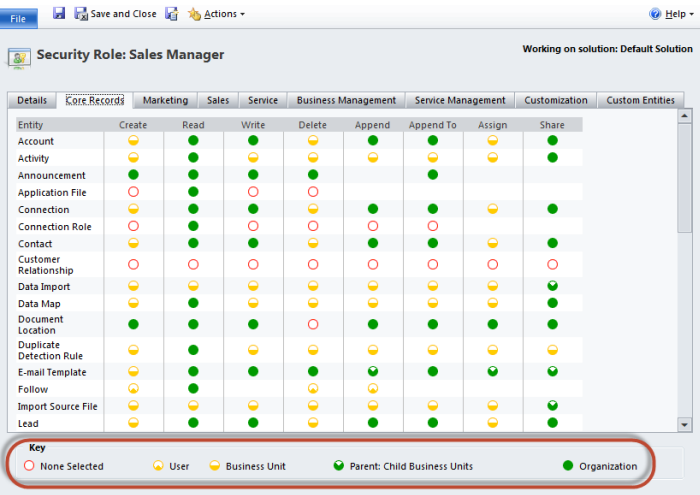 The built-in security functionality of the Dynamics CRM platform is nothing short of extraordinary. The ability to make the wide range of system and user specific settings using a system of ‘colored circles’ pioneered by Consumer Reports in their ratings system is unparalleled in it’s ease of use and power. But with all this power comes a challenge. It is easy to apply security settings that sometimes don’t always behave the way one would expect. One immediate ramification is that users are locked into a requirement or locked out of doing something. 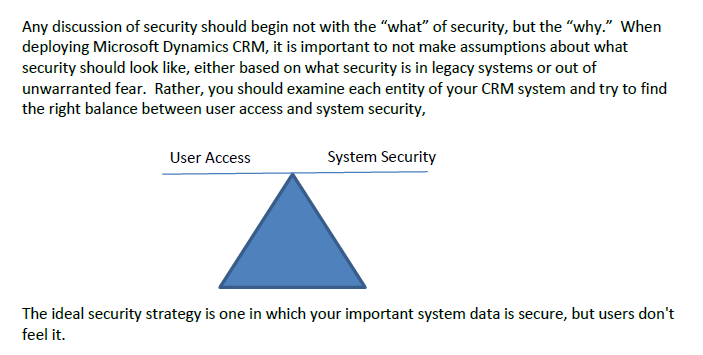 This chapter first addresses the need to balance User Access with System Security. The Chapter then goes on to provide guidance on how to build a security strategy, tools to implement the strategy, security settings, and then wraps it up with best practice recommendations. Great post, this is a must have book for everyone in the Dynamics CRM community, lots of useful information.